I'm a little late getting today's blog post up but it's a holiday Monday here in Alberta and not following my regular schedule all weekend has thrown me for a loop. My husband and son have been away for the weekend at a robotics competition so I've spent a large part of the weekend crafting while watching movies! I don't normally watch tv while I craft, it's usually quiet or I'll have the radio on. But I found it a bit too quiet here this weekend and needed something on in the background. My first choice was to finish watching This is Us. Well that was a mistake - it's very hard to craft through tears. So after I recovered from that I chose only comedies and action to watch and it worked much better lol. On to today's project. This is a CASE from a Christmas card that we made at my Christmas stamp-a-stack. The initial card was CASEd from Donna Wizniuk. I just remade it into a birthday card using the dragon from the Magical Day stamp set. I love this dragon! 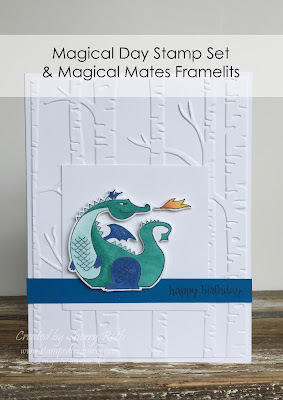 He's colored in using our Stampin' Blends markers. I seriously can't get enough of these markers. I've been coloring so much! It dawned on me last week that you can get the ENTIRE set of Stampin' Blends (all 27 markers) as your starter kit! What that means is that you can get the whole set (valued at $187.11 - with shipping and GST) for just $135 - no shipping and no GST! What an amazing deal that is! Save big on those wonderful markers and then decide what you'd like to do, if anything after that. You can continue to purchase products at a discount, gather friends and family for an occasional class, decide to run your own business or choose to do nothing at all. The choice is yours! Why not give it a try, you've got nothing to lose? Purchase your Stampin' Blends as part of the starter kit today!